Creative writing, that’s just for novels and short stories, isn’t it? 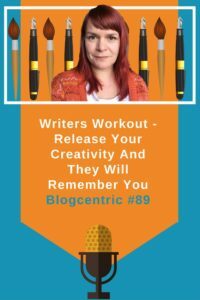 Or could it help you build those writing muscles and add a bit of seasoning to your blog? In episode 86 I challenged you to try Morning pages. I was sceptical at first but I can tell you I’ve well and truly embraced it now. Almost a month after I started and I’m still sitting down before work every working day and writing my 3 pages. In episode 87 we looked at how to simplify our language and be more accessible to our online readers. 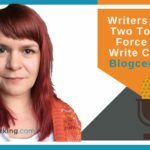 I showed you a couple of tools that can help you to add clarity to your writing and challenged you to use them for a blog post. Last week in episode 88 we looked at the benefits of having a blogging buddy. 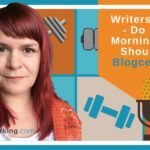 Someone who can be your blogging partner, that you can work with to grow your blogs together. I was delighted to see at least one, if not two buddy matches made in the Facebook group as a result. I feel like I’ve been working my writing muscles for these past four weeks. I hope you have too. I know what you’re thinking, I know because it’s what I’ve been thinking in the run up to creating this podcast. Is creative writing necessary? 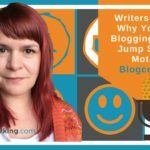 Does it even have a place in a business blog? I’m going to say yes, yes it does. 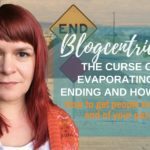 As I started looking around me at my fellow bloggers I started noticing creative turns of phrase, storytelling, emotion all embedded in their business content. That’s from Ann Hanley’s blog. The essence of the sentence (or two) is. ‘I know I used a buzzword but I’m going to tell you why’. I much prefer her version. That’s a clipping from the John Muarry Headshots blog post on Corporate Wellness. In order to make his point John tells us a story. His readers will relate to Mary and will want to read on to see what happens. Another story, this time from the ‘Beyond The Fold’ blog. As I read I can hear the sound of book covers smacking on the table. I can see them doing it. This sensory experience makes the piece more memorable. 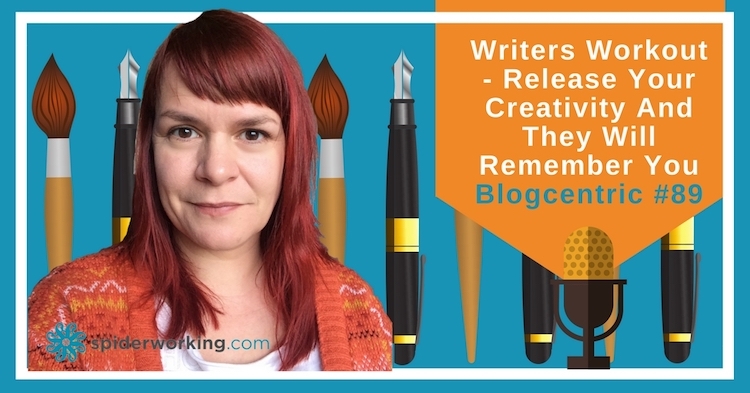 With those examples in mind, lets look at what creative writing can do for your blog. Your posts will be more memorable. If your reader has created that picture in their head they’re more like to remember it, and you. Be understood. I use storytelling when I teach a lot. If I can wrap my key points in the narrative they become easier to understand and relate to. If I told you that my cat was tiny you may conjure up a picture of a small cat. If I told you my cat could squeeze into a straight sided pint glass you’d have a completely different and more memorable picture. You’d also have a more accurate idea of her size. If I Google ‘Creative writing exercises’ I get over 6,000,000 results so instead of choosing one of those exercises I’m challenging you to do one I use with delegates when I teach. This is just an exercise, you’re not going to get a blog post out of it but it will help you ignite your creativity. Do it frequently and you’ll find it easier to incorporate creative moments into your content. Now that you’ve switched off one of your senses start to open your others one at a time. Write it down (you’ll have to open your eyes for that). Try to be as descriptive as you can. Is it the whisper of the wind, the creak of the old house, the dull buzz of electricity? Write it down, again be as descriptive as possible. It’s been a while since I’ve done this exercise so I included it in my Morning pages today. I found it refreshing. As I tried to find ways to describe what I was feeling I found I was making better, more honest and less cliched descriptions. It helped me to shrug off the shorthand I often use when writing and think deeper. Now you’ve done the exercise once do it over and over again. You could incorporate this into your morning pages like I did or go to different locations and try it again. If you’re brave you can try and describe a memory, send yourself back in time and try and remember what was hitting your senses at the time. Back in episode 3 I interviewed Eamonn O’brien from the Reluctant Speakers Club. He recommended keeping a story book. Each day look for a story to relate in the book. It could be an overheard conversation or something odd that happens. By doing this you will have a bank of stores to draw on for your posts. Remember by using these techniques in your blog you’ll become more memorable to your audience and you’ll find it easier to make yourself understood. Next week we’ll be starting a new series on technical blogging issues. If you’ve any topics you’d like me to cover you can Tweet me @spiderworking or you can join the Small Business Bloggers Facebook group.